PMCs: The End or the Beginning? This feature is special to our Private Military Contractor (PMC)’s Week – a look at PMCs’ utility and future, especially in the maritime domain. The National Intelligence Council’s report Global Trends 2030: Alternative Worlds released in December 2012 revealed trends, game-changers, and potential worlds that have relevance to maritime security. Two of the four mega-trends identified were individual empowerment and diffusion of power. Two game-changers will be a governance gap (or previously suggested maritime security shadow zones) and the potential for increased conflict. It suggests one potential future of a “Non-state World” in which non-state actors take the lead in confronting global challenges. If this is the future, where the power of traditional states erodes or collapses and individuals and illicit organizations are super-empowered, private maritime security companies could be far more employed than they have been in the past decade. The quick rise of PMSCs in the past decade was due primarily to the threat of non-state actors—in this case Somali pirates operating off the Horn of Africa. Before the shipping industry responded to changes in its Best Management Practices and states began devoting more air and surface naval platforms to the region, individuals identified an opportunity in maritime security and formed companies. Whether they are mercenaries or entrepreneurs can be left to a discussion in the classroom or comments, but the reality is that the immediate threat to shipping was real and growing by 2006. The companies themselves were analogous to dining in a large city. In the first category are the four and five star restaurants with superior ingredients and preparation, excellent service, but very costly. The second category includes standard restaurants. The third might be diners— affordable food, quick turn-around on service, and a dependable location. The last category is the street vendors. Because they have no infrastructure other than a mobile cart and they may not carry the best ingredients, their costs are extremely low. But there is a market for each of these categories. According to Cook, the number of PMSCs peaked in 2011 when eleven new PMSCs were applying every month for membership in SAMI. While there were an estimated thirty-five to fifty companies in 2010, SAMI now has about 160 members. The industry became highly competitive and very litigious. With some twenty to twenty-five percent of overcapacity in the shipping industry, shippers are trying to find ways to reduce costs and prices. 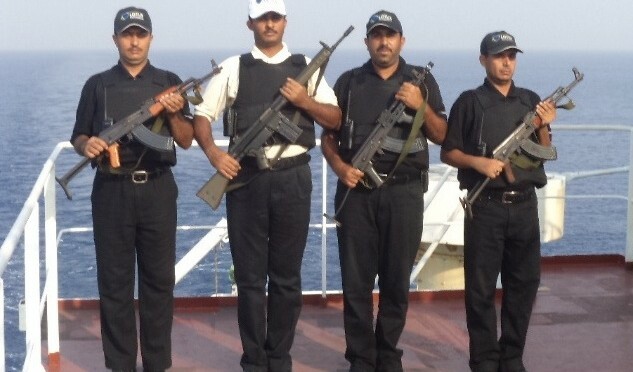 When threats by Somali pirates resulted in far higher insurance rates, shipping companies reluctantly turned to protection from armed guards. At their height in 2008 to 2009, some PMSCs could charge $5,000 per day for a four-man team; today that price is down to about $3,500. Since, to date, not ship with an armed team has been taken by pirates, that investment more than offset the potential of paying hundreds of thousands to millions of dollars in ransom. Although some in the industry argue that incidents of piracy remain unreported or underreported in order for companies to avoid higher insurance rates, the fact is that Somali piracy has dropped precipitously. As a result, Cook notes, there has been a major consolidation of PMSCs. That is not to say they will disappear or their work will not expand. To the contrary, they will likely be more necessary in the coming decades for several reasons. First, long-time state navies with global projection (such as European nations or even the United States) are likely to diminish in size and projection capability due to increased domestic funding demands. Second, increasing competition for scarce resources and changing demographics will lead to greater instability among underdeveloped nations, particularly those along coastlines. Third, greater need for energy will result in more off-shore oil and gas platforms (currently twenty-five percent of all oil and gas platforms are off-shore such as those in the Gulf of Guinea.) Fourth, as one presenter at a recent Naval War College symposium suggested, a greater need for food sources will result in aqua-farming areas. Simply put, less maritime security capabilities by states and increased needs for security will lead to a greater reliance on PMSCs. What does this mean for the United State? Most importantly, the nation will have to work with the industry in ensuring it is regulated and accountable. With Somali piracy, the country – like many European countries – was opposed to the use of PMSCs or at least did not recognize them. Public officials and senior military now recognize the partial role they have played off the Horn of Africa. The industry has already begun to self-regulate internationally. Operators quickly share information with each other on the reputation of firms and which ones should be avoided. In addition, organizations like SAMI provide standards such as certifications as a vetting conduit between PMSCs and the shipping industry. In the coming decades, maritime security will be far more complex. Absent sufficient state navies and coast guard forces, PMSCs may well be the only alternative to ensuring platforms and regions have some semblance of security. Claude Berube teaches naval history at the United Stated Naval Academy and is the author or co-author of several books including “Maritime Private Security” and his debut novel “The Aden Effect.” In December 2013, CIMSEC published his article and interview regarding “Civilian Warriors”. He is the immediate past chair of the editorial board of U.S. Naval Institute Proceedings. Thank you for this very interesting article Claude. I agree with you on most points.